The Couch has been part of my life for quite awhile. I’ve interviewed them more than once and they were part of my return to college soundtrack. There were times when I would run into Taylor in Derrick Hall as I was listening to his album between classes. I first met him when I interviewed him for Backbeat Magazine in 2011. As editor-in-chief, I was in the middle of production for the first (and only issue) and needed to fill a page. Someone suggested The Couch and told me to reach out to Taylor who was playing a show that night with his other band, Calm Blue Sea. I did and he made the interview happen. I rushed home as soon as it was done and wrote the article. “I really don’t know what you’ll call us. A lot of people say you’re Blues, kind of like The Black Keys, but I don’t know,” said Taylor Wilkins. While the similarities are noticeable in Wilkins’ voice delivery and bluesy guitar sound, it’s still hard to classify yourself when you’ve gone through changes like Wilkins has with his band The Couch. It’s cliché to say that, because most bands, especially in the local music scene, are always trying to figure out that sound that defines them and searching through the revolving door of musicians for that perfect line up. The Couch can be seen as no different. But still, the music from the three band members evolves with each change, no matter how big or small that change is. The original bassist Matt Adams was also a roommate at the time. Having all three members spend their time practicing and living in one place together sometimes became too much. “We were bandmates, roommates and friends, so it was a triple threat to that relationship,” said Wilkins. “There were definitely crossovers. It was hard to keep thing separated, but we were really close, still are.” Adams has since left the band and Kyle Robarge had stepped in to fill the bass lines, but Adams is still around. “In fact, Judd and Matt are roommates now in Austin,” said Wilkins. And jump in they did. Since the move, they’ve released a few EPs and went through a lineup change and a name change. For those that braved the Texas winter to check out some local bands during Free Week may have noticed Devil in the Drink, but on stage, it was still Wilkins, Johnson and Robarge better known as The Couch. “We felt like we needed to change it. I guess maybe I did,” said Wilkins. 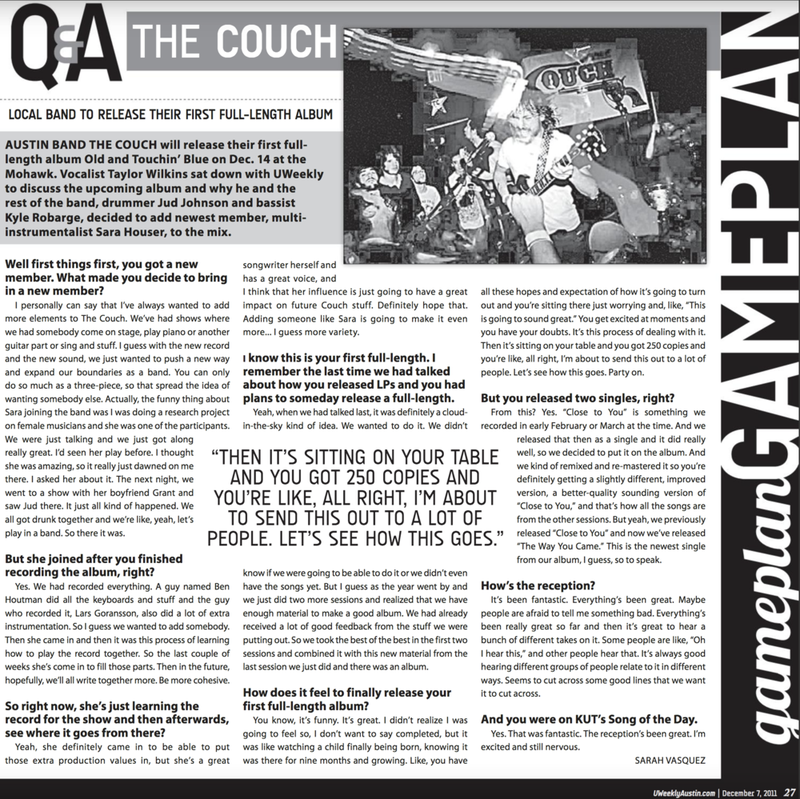 “We all came with this decision that we’re moving to Austin, we should change the name.” However, months later, the band went back to calling themselves The Couch, which also pleased their fans. “We decided that wasn’t great,” said Wilkins. “We went back to The Couch, and it was like going back home.” Even though, the Devil in the Drink name didn’t work out, Wilkins thinks it was needed. “We needed to get out of (The Couch) for awhile,” said Wilkins. The Couch announced on their Facebook page at the beginning of June that they are reentering the studio with producer Lars Goransson at Sounds Outrageous Studio. The same producer who produced the May release Close to You EP. Whether they are The Couch or Devil in the Drink, Wilkins said it’s hard to say if listeners will notice a change in the next recording. 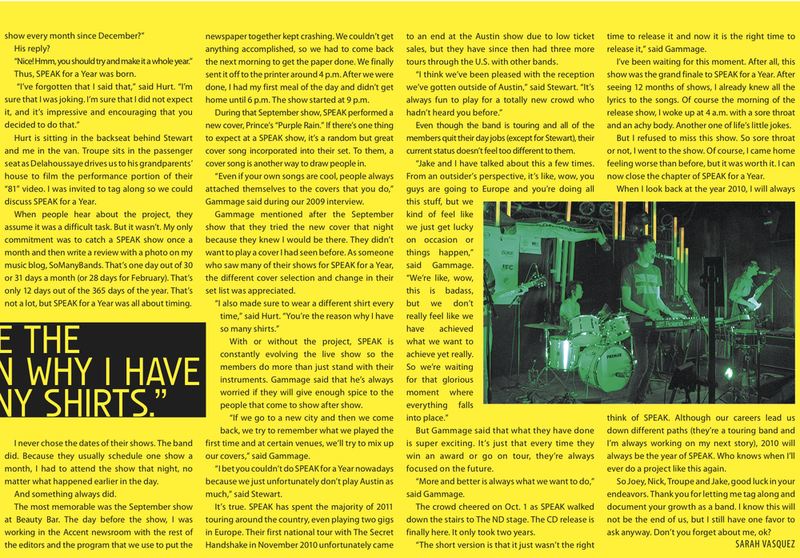 I interviewed Taylor again for UWeekly Magazine later that year when Sara Houser joined the band. And then I wrote an in-depth piece when Sara left the band and formed a new band in 2014. My originally intent was to write a feature about Löwin, but as I was interviewing her, I realized this is more about the story of The Couch. So it turned into a 2,000 word monster that took up my life for a few months. I’m really proud of it though. I’m so excited to see The Couch reunite Friday night at the Hole in the Wall. I’ll admit that it’s been awhile since I’ve listened to the albums on repeat, so hearing some of these songs in a live setting will be a nice retrospective. By the way, Taylor and Sara are still going strong. They’re getting married the day after the show. It's been five years since this crazy idea of mine (the first of many to come) made the front cover of a magazine. Who would have thought walking into that Cage the Elephant show that fateful night would change my life?